The Congress leader stood firm on his 'Vikas paagal ho gaya hai' assertion, in reference to development in Gujarat, claiming he would not abstain from speaking the truth. BANASKANTHA: Congress vice-president Rahul Gandhi on Sunday stood firm on his 'Vikas paagal ho gaya hai' assertion, in reference to development in Gujarat, claiming he would not abstain from speaking the truth. 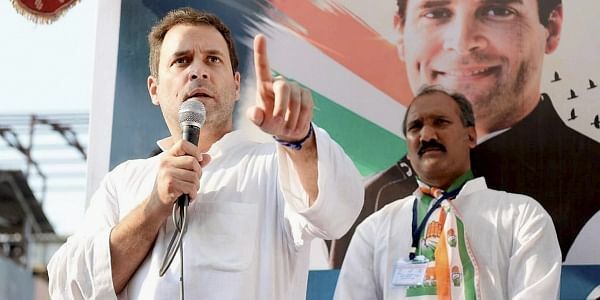 Speaking at an interactive session with social media volunteers of his party in Gujarat's Banaskantha, Rahul slammed Prime Minister Narendra Modi for disrespecting the office of the prime minister when he was in the Opposition, and said that the Congress would never do the same. This is a reiteration of his last month's assertion wherein, in the run up to the Gujarat assembly polls, the Congress scion had cornered Prime Minister Modi and the BJP Government in the state over the development achieved in the state, likening it to a person and saying it had gone berserk. "Gujarat mein vikas ko kya hua? Ye kaise pagal hua? Ye jhooth sun sun ke pagal ho gaya hai (What happened to the development in Gujarat? How did it go berserk? He did after listening to constant lies)," Rahul said, at a public meeting in Gujarat's Kheda. Meanwhile, Rahul, in today's address, further claimed the truth of Gujarat was that Prime Minister Modi has given everything to few businessmen, and that small businessmen of Surat had said that the state had the most corruption. Accusing the BJP of indulging in politics of lies in Gujarat, Rahul reiterated that the Congress’ policy was that of truth. “We accept that there are faults in this country, but we also know there is a lot of strength in this country, and the biggest strength of this country is its ability to accept truth,” he said. Stressing that Congress would win with truth at its side, against Prime Minister Modi, who he earlier claimed, has Gujarat government, Delhi government, police, army, airport, and the media, he added, "I am not talking about people in the media. They want to promote truth but there is control from the back. These people send the truth to their bosses but they fine-tune the truth." At the event, the Congress vice-president also opened up about his much publicised Twitter handle. “We reflect on ideas; there is a team of three to four people, to whom I give suggestions and after fine tuning them, we tweet. Routine work, like birthday wishes isn't done by me, I give little inputs on it; tweets on political issues are mine," he said. Earlier in the day, Union Minister Prakash Javadekar gave it back to Rahul on his above-mentioned assertion in the same vein and said it was not 'vikas' but the grand old party that had gone berserk. He said, "Vikas paagal nahin huya hai. Congress paglaa gayi hai. Vikas toh apni jagah par hi hai (the Congress has lost it. Development is at its place)."